A Grateful Heart by Nancy Weshkoff | Moonflower Yoga Inc. I wrote this blog 2 years ago during Thanksgiving week The sentiments expressed in the blog are still true, and I encourage all of you to take a moment to count the blessings in your life. Doing so can help you realize how amazing each day that we spend on this earth can be. Here is the blog, and I wish you all a very happy Thanksgiving! As we celebrate Thanksgiving this week, I am taking a moment to pause & think deeply about the holiday. If you look at the media blitz around us, you would assume Thanksgiving is about shopping for items you probably don’t need at discount prices. Stores are opening earlier and earlier, and this often means families spend less time together as they rush to get to the mall. What happened to this wonderful holiday with its family traditions? I am grateful for the many students who walk in the doors of Moonflower Yoga to attend a yoga class. It is such a blessing to have them at the studio each week, getting stronger, feeling better, and sharing a part of their lives at Moonflower Yoga. I love meeting each person as they walk in the door and catching up with them each week. Thank you to all of you who have made Moonflower Yoga a success. It was 4 years ago this month that my life changed forever with the news that my job in corporate America was coming to an end with a forced layoff. Although that news was devastating at the time, it gave me the opportunity to try something new that I always wanted to do. Moonflower Yoga was born as a result of that, and I am grateful that my life changed for the better. As Gandhi very wisely said: “Be the change that you wish to see in the world”. Making a life change would have been very challenging if it wasn’t for the support of my husband, Bob, who has been my rock for the last 40 years. Bob, together with friends and family, supported me and Moonflower Yoga, and I am very grateful for their love and support. And Bob’s delicious, homemade desserts at our workshops, events, and Moonflower Yoga Book Club meetings bring a smile to everyone’s face. Moonflower Yoga has great yoga teachers who work alongside of me each week and bring their love of teaching and helping people to Moonflower Yoga each week. I could not run the studio without them. And there have been wonderful workshop presenters as well, who have taught us some very interesting things that we didn’t know before and helped us learn something new. I am grateful to all of the great instructors and workshop presenters for making Moonflower Yoga a special place. I am grateful to my hometown of Bellmore, Long Island, in New York’s Nassau County. I have been welcomed in the town as a new business, and it has been awesome to establish my business roots here as well as my home roots. I always learn something new at the Bellmore Chamber of Commerce meetings. I am grateful to my yoga teachers who helped me discover the wonders of yoga many years ago. Yoga has been my rock when things were stressful, and now it has become my life. It all started with attending my first yoga class, and it grew from there. Yoga can help you too! 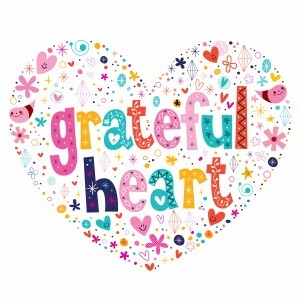 What are you grateful for this holiday season? Take a moment to reflect on the blessings in your life. You will feel inspired! Have a wonderful Thanksgiving holiday.